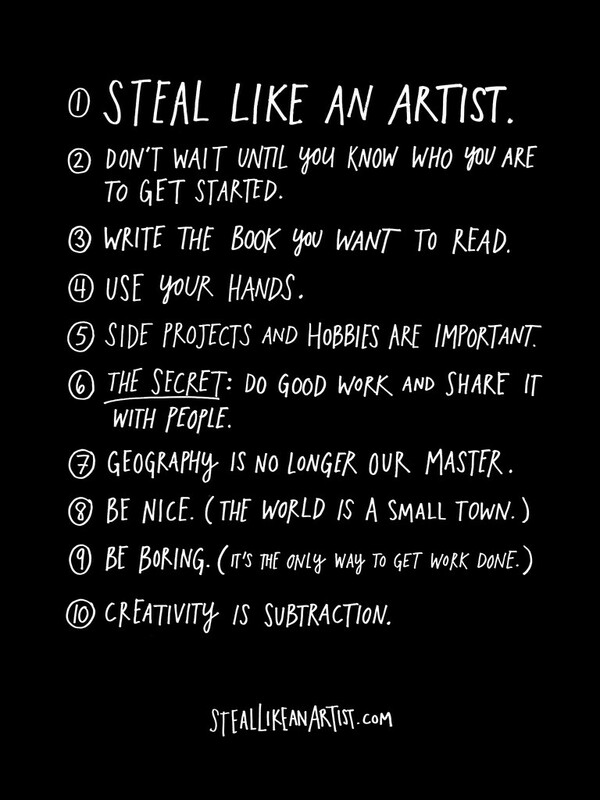 Lessons from Steal Like An Artist by Austin Kleon. 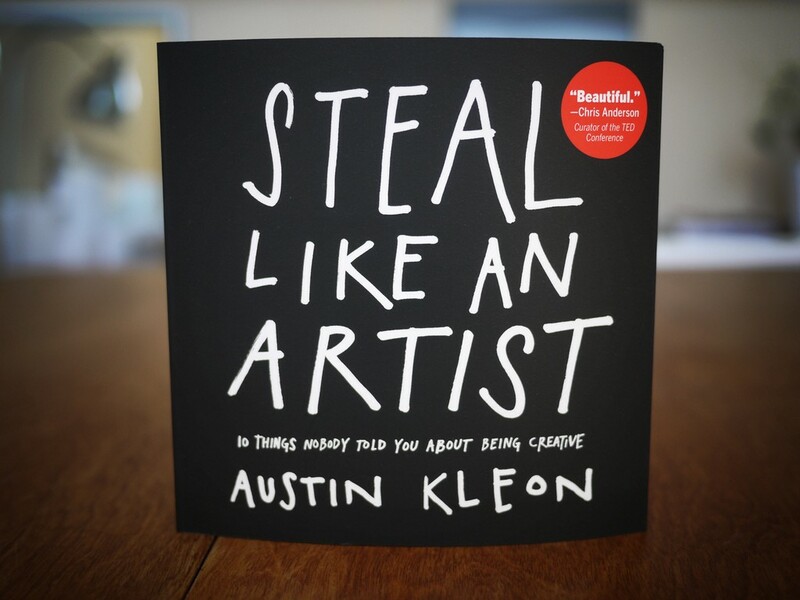 Steal Like An Artist : 10 Things Nobody Told You about Being Creative by Austin Kleon is a quick read that gives good instructions, healthy encouragement and real advice to any budding artist (i.e. creative types) while maintaning a good balance of quirkiness and humor. Austin argues that creative work builds on what came before, and thus nothing is completely original. He advises us to look at the things this world has as either worth stealing or not worth stealing. Steal the things that will help make you (or your business) stand out. 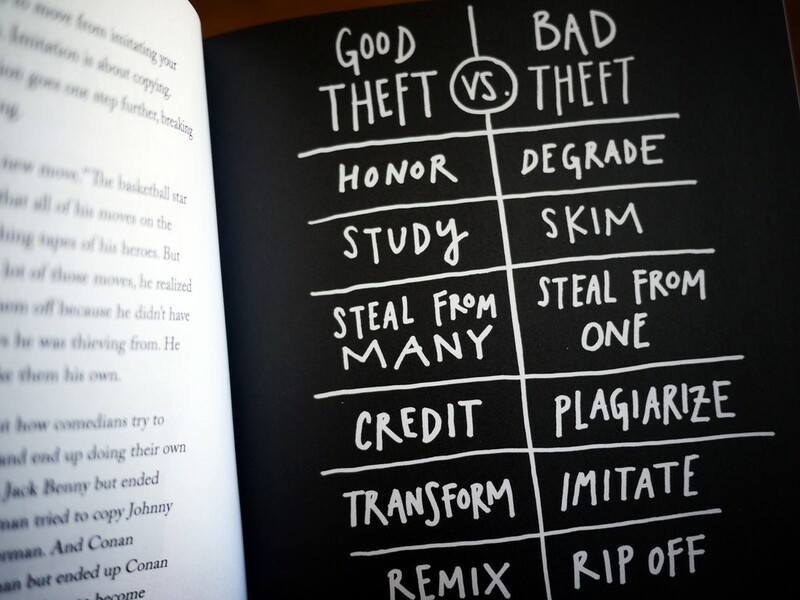 The author adds that he does not mean ‘steal’ as in degrade, skim,imitate or rip off — but study, honor, remix, transform and credit. Don’t just steal the style, steal the thinking behind the style. You don’t want to look like your heroes, you want to see like your heroes. The reason to copy your heroes and their style is so that you might somehow get a glimpse into their minds. 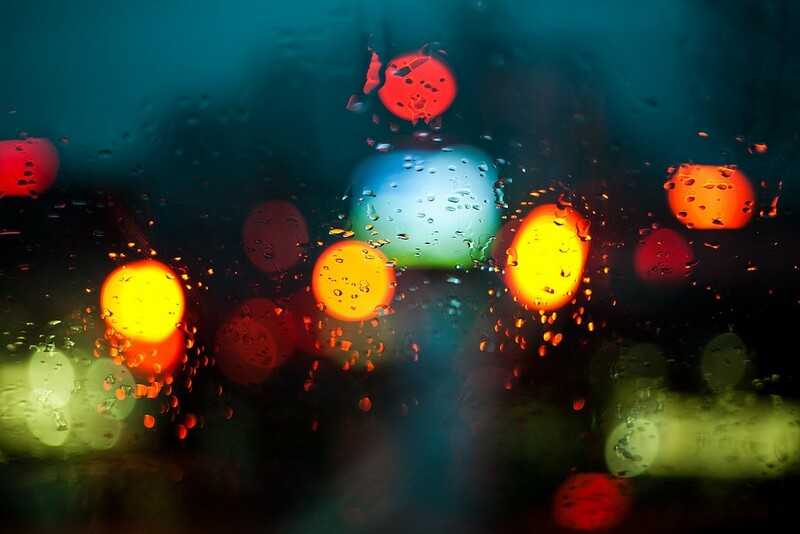 That’s what you really want — to internalize their way of looking at the world. If you just mimic the surface of somebody’s work without understanding where they are coming from, your work will never be anything more than a knockoff. 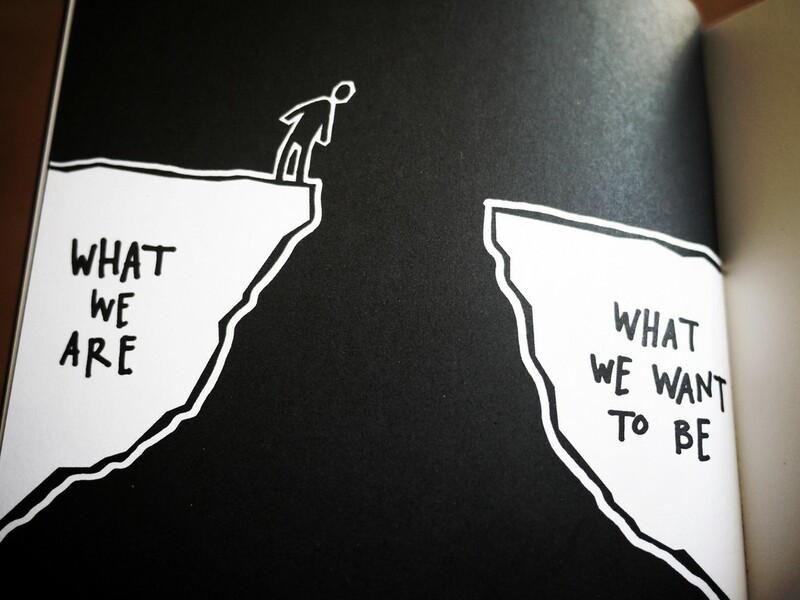 In a world that is changing every day, it is too hard to find out who we are before we start taking action. So, Austin urges us to just go with it until we actually figure it out. You have to start doing the work you want to be doing by copying your heroes; then, go beyond imitation to emulation and finally, you will end up with your own version of the thing you want to be doing. 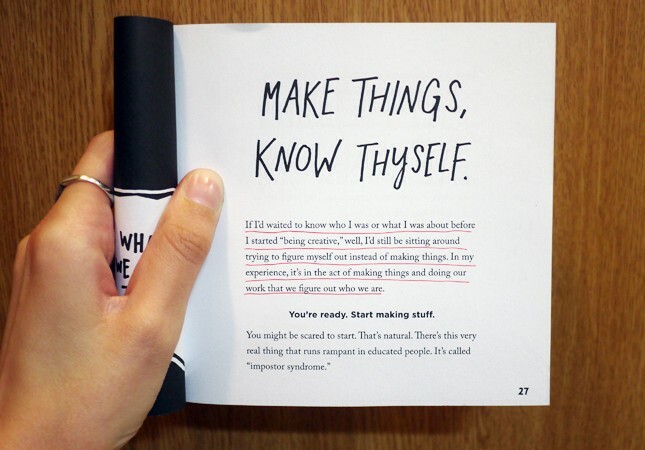 Draw the art you want to see, start the business you want to run, play the music you want to hear, write the books you want to read, build the products you want to use — do the work you want to see done. It’s important to create things that you will use instead of something for someone else. Austin claims that if you do that, even in the worst case scenario you will have one customer — yourself. 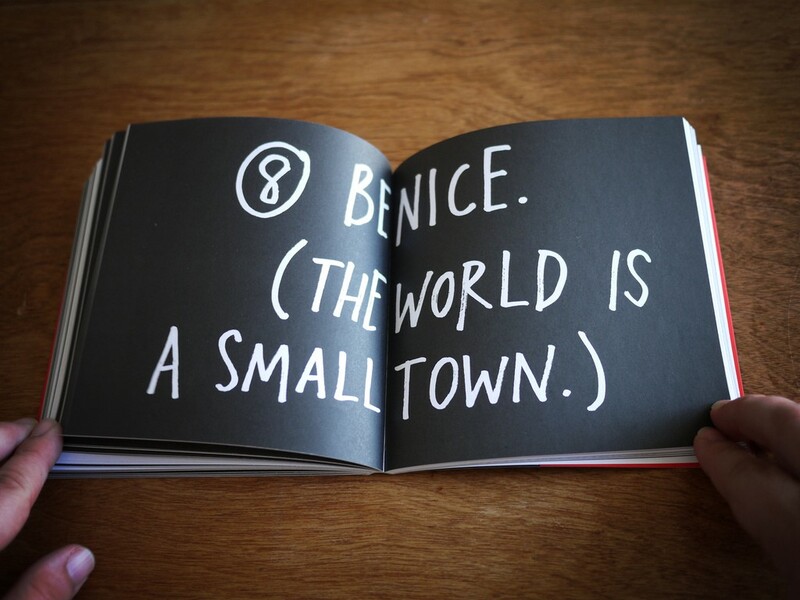 Kleon reminds us that creativity peaks when we involve all of our senses. Hence, it’s important to deviate away from the computer screen and to immerse in actual physical work to help kick-start our brains into action e.g. play guitar, cook or bake, etc. Computers have robbed us of the feeling that we’re actually making things. One thing I’ve learned in my brief career: It’s the side projects that really take off. By side projects I mean the stuff that you thought was just messing around. Stuff that’s just play. That’s actually the good stuff. That’s when the magic happens. By keeping your passions alive through side projects and hobbies, you become more creative in your actual work that pays. You don’t need to make money with everything you do. 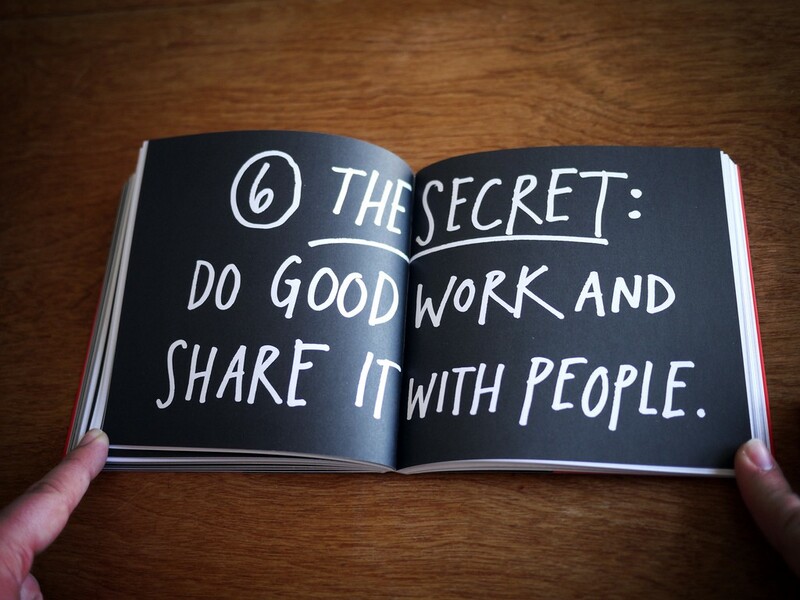 Sharing your work and even your thoughts about what you like help you get good feedback and more ideas. 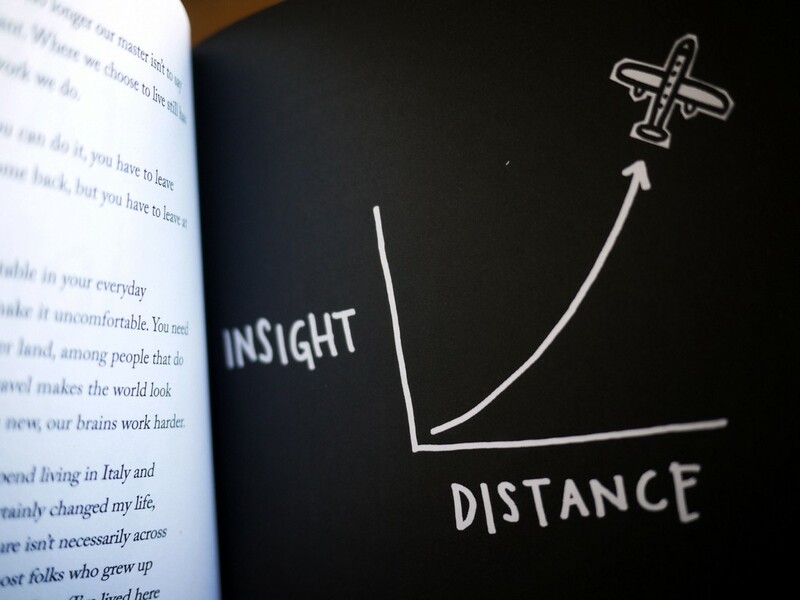 Distance and difference are the secret tonic of creativity. Life’s a marathon, not a sprint. Stop fighting and competing. Channel your rage into a creative pursuit. make friends, ignore enemies. Show appreciation for the good things you see around you. Be grateful. There’s only one rule I know of: You’ve got to be kind. 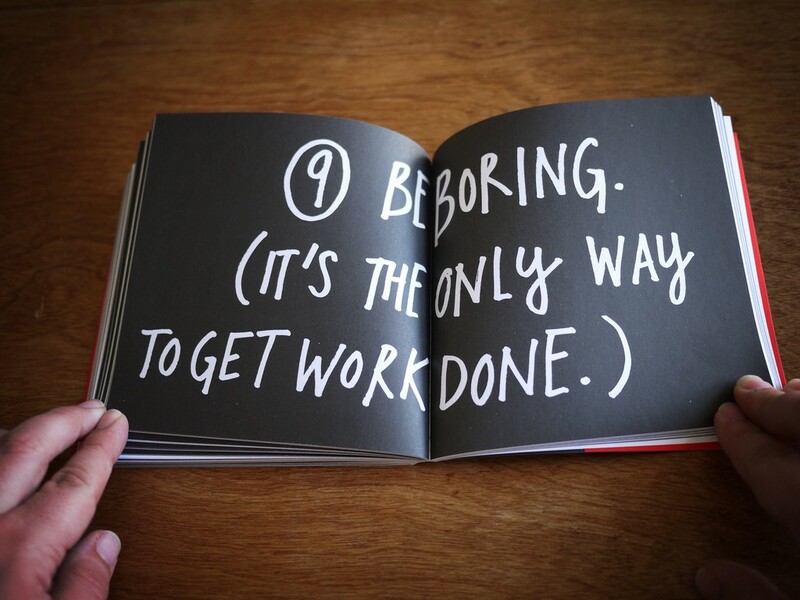 Routines (i.e being boring) are important to make sure you are using your valuable brain cells and scarce creative capacity on the tasks that matter. Nothing is more paralysing than the idea of limitless possibilities. 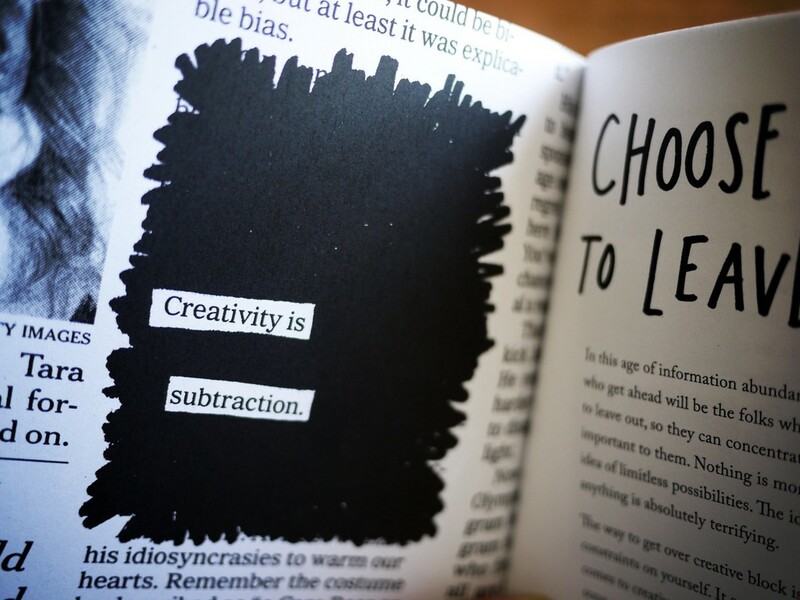 The best way to get over creative block is to simply place some constraints on yourself. In this age of information abundance and overload, those who get ahead will be the folks who figure out what to leave out, so they can concentrate on what’s really important to them. A good example of substracting to create awesomeness is Dr Seuss, who wrote his bestselling book with only 50 different words. Saul Steinberg says a work of art represents a struggle against limitations. Always be reading. Go to the library. There’s magic in being surrounded by books. 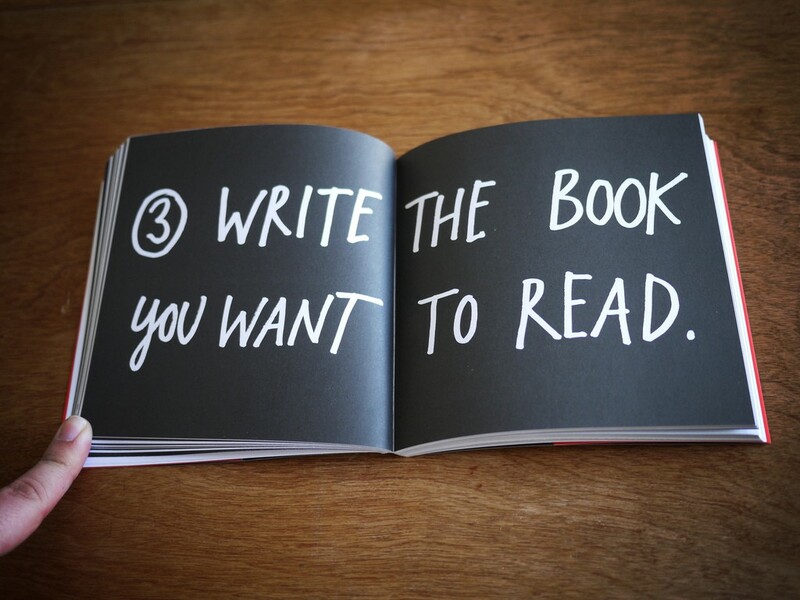 Collect books, even if you don’t plan on reading them right away. Keep a scrap book or ‘swipe file’ to jot down notes about your observations. Search the things that relates to your observation and then, research to produce your own view on it. Using computers in the ideation stage may actually turn you into ‘edit mode’ even before the idea has been fully explored. Instead try having a digital desk and an analogue desk. How to research: Find one thinker, artist, or artist who you admire and research everything about him/her. Then, find a few people that influenced him/her. Now, find out everything about these influencers. Keep going up till you build your own tree. Now, you are ready to start your own branch. If you have two or three real passions, don’t feel like you have to pick and choose between them. Don’t discard. Keep all your passions in your life. You can cut off a few passions and focus only on one, but after a while, you’ll start to feel phantom limb pain. 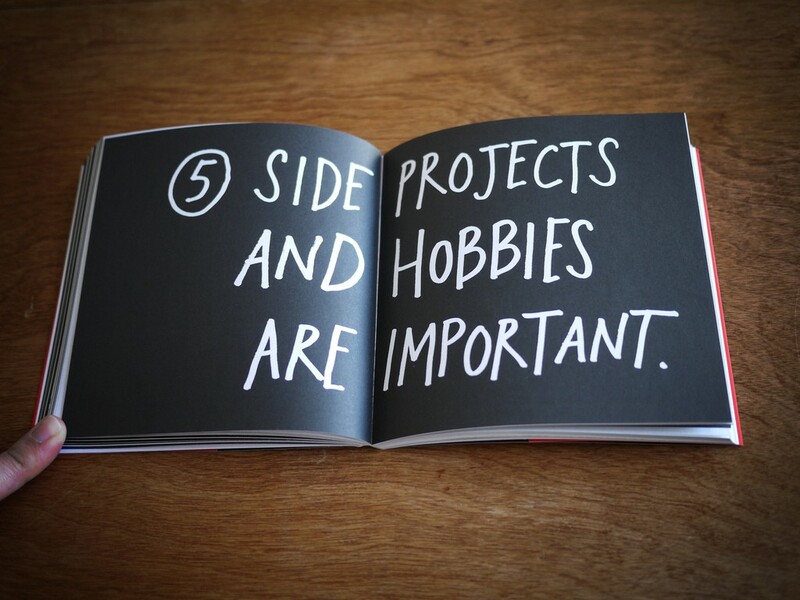 Keep your day job until you are making as much as through your side project. A day job gives you money, a connection to the world, and a routine. Freedom from financial stress also means freedom in your art. The trick is to find a day job that pays decently, doesn’t make you want to vomit, and leaves you with enough energy to make things in your spare time. Keep a praise file (positive feedback) and a rejection file (negative feedback). The praise file will help you when the rejection file gets too thick! Get a wall calendar which shows you the full year ahead so that you get a good sense of what’s coming. Keep it updated. The only art I’ll every study is the stuff that I can steal from. In the digital age, don’t forget to use your digits! Avoiding work is the way to focus the mind. Every idea is a juxtaposition of existing concepts. You’re only as good as the stuff you surround yourself with. Thanks for reading this far! If you got value out of this book digest, it would mean a lot to me for you to scroll down a bit farther and hit the recommend button. SK lives in Kuala Lumpur, Malaysia. He is a coffee addict who happens to write about productivity, entrepreneurship and lifehacks at sathyvelukunashegaran.com. You can also follow the rest of the book summaries here.